Location/ Directions: FROM COLUMBUS, I-270 TO US 23 SOUTH (30 MILES). FROM CHILLICOTHE, US 23 NORTH (20 MILES). About Hotel: 3-Floors, 69-Rooms, Interior Corridors, Business Center, Health and Fitness Center (On-site), Pets Allowed (fee), Indoor Pool, On-site Guest Self-Laundry Facilities (washer/dryer), Daily Housekeeping, Ice Machine, Free Morning Newspaper Delivered to Room, Free Continental Breakfast, Color Cable / Satellite TV, Stereo, Work Desk w/ Lamp, Speakerphone with Voice Mail, High-speed Internet Access, Bathtub, Hairdryer, Private Bathroom, Coffee Maker, Microwave Oven, Mini Refrigerator, Connecting Rooms, Crib, Double Glazed Windows, Individually Controlled Air Conditioning, Iron/Ironing Board, Roll away Bed/Cot, Windows Open by Guest. Railroad View: Good View. Ask for a high floor room on the front of the building, railroad is off to the left. Railroad end of the building will be better. Rear rooms maybe block by trees. Railroads past Hotel: CSX Transportation (former C&O Railroad). 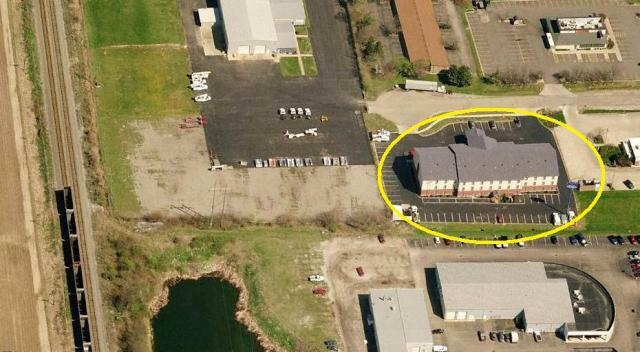 Photo Comment: The aerial view shows the Holiday Inn Express circled in yellow, this picture looked at the back of the motel. The railroad is seen to the left with the rear of a southbound hopper passing the motel.